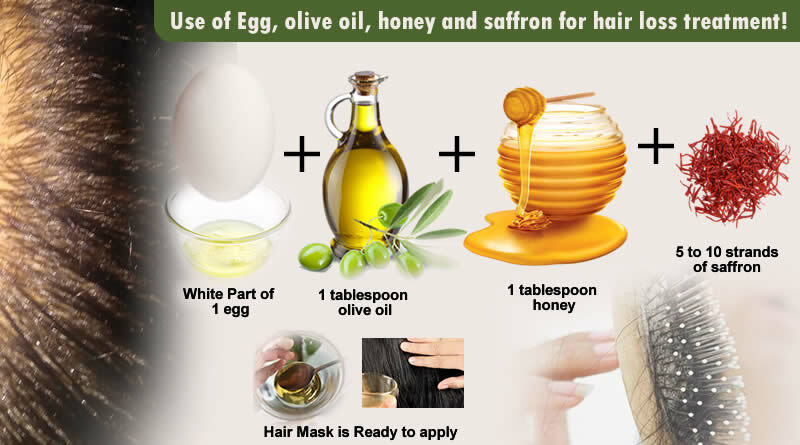 The naturally available Egg, Olive Oil and Honey are make a good hair mask for instant relief in hair loss, hair thinning and hair falling. Egg contains a lot minerals and protein to repair hair and stop hair fall. Saffron contains an abundant quantity of antioxidants which are helpful to stop hair fall. The humectant properties of honey help control and retain moisture in hair and stop hair loss. Olive oil moisturizes your hair and reduces scalp irritation, which further reduces dandruff. 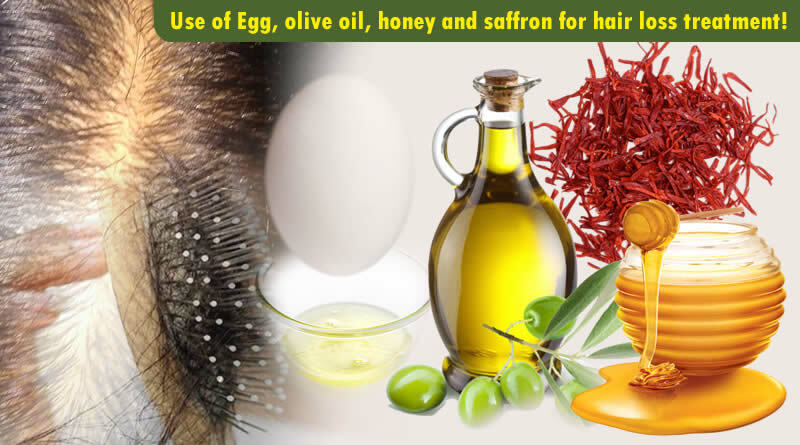 The combination of egg, olive oil and honey is an effective herbal treatment for hair loss, hair thinning and hair fall. Instant Remedy for you hair loss and hair fall problem – 100% cure! Do you want to get rid of the hair loss? Are you looking for the herbal treatment to prevent hair loss, hair thinning and hair falling? Hair loss or Hair Fall is an abnormal state in which includes loss of hair or thinning of hair or the complete breakage of hair strands from the scalp or head or body. Scientifically, Hair loss is also known as alopecia or baldness. The problem of hair falling or hair loss can vary from specific part to entire body. Here, we are discussing about hair loss or hair falling in terms of hair falling from scalp or head region. As per observation, the loss of 60 to 100 strands of hair in one day is a normal one but if loss of hair is more than 100 strands in 1 day then it is reason to take care of it. Hair loss or hair fall can be temporary or permanent. 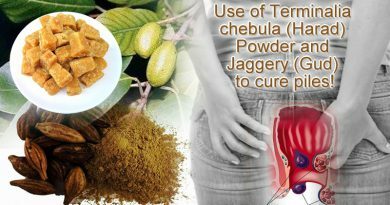 In both conditions, it is curable by means of herbal treatment. Generally, the hair loss is recognized by clumps of hair in your brush during hair combing or hair washing. Many times, thinning of hair and bald patches are also observable. As per scientific categorization, the hair loss or hair falling is various types just like male-pattern hair loss, female-pattern hair loss, alopecia areata and a thinning of hair known as telogen effluvium. It is found that hair loss is due to some common reasons such as the pulling out of hair, certain medications including chemotherapy, HIV/AIDS, hypothyroidism, and malnutrition including iron deficiency. Sometimes, hair falling is found due to scarring or inflammation such as fungal infection, lupus erythematosus, radiation therapy, and sarcoidosis. Hair fall is most frequently widespread in people who have had a family history of hair loss, genetic issues play a vast role in this. Many times it is noticeable due to hormonal secretions during puberty. Other specific causes such as shocking events, operations or surgeries and major illnesses can also activate acute hair loss or fall. In such circumstances, hair starts growing back on its own after some time. Momentary hair loss can be caused due to menopause, sudden interruption of birth control pills, childbirth and hormonal changes due to pregnancy. Occasionally severe medical conditions can also cause hair loss or fall just like scalp infections (ringworm), alopecia areata (autoimmune disorder which damages the hair follicles) and thyroid disease. Conditions like lichen planus and a few types of lupus can also cause lichens which result in hair loss. Several times hair loss can also be caused by the use of medications used to treat heart problems, depression, arthritis, high blood pressure and cancer. In other causes, Emotional or physical shock can also start hair loss such as high fever, extreme weight loss and death in the family. A hair pulling disorder known as trichotillomania makes the affected person pull out his/her hair intentionally. It is an impulse control disorder which can be cure by therapy. The affected person can pull out hair from their eyelash, eyebrows and the scalp. Tying our hair very forcefully puts immense pressure on the hair resulting in damage. This is known as traction hair loss. Due to less consumption of iron and protein in your diet can also lead to thinning of hair. Medical Treatment of Hair loss or Hair Fall: Generally, Dermatologists are advised medications which have corticosteroids ingredients such as minoxidil (or finasteride), Hair transplant surgeries and scalp reduction surgery is also recommended in acute cases. 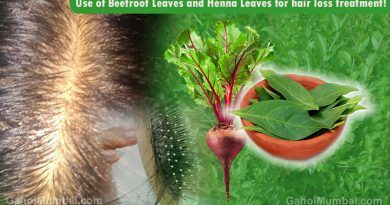 Herbal Treatment for Hair Fall or Hair loss: Nowadays, hair on crown or stylish hair is become an important factor of human personality. Extreme hair loss can be a worrying problem, often triggering anxiety and affecting self-confidence, especially for women. We are providing here a lot of Home Remedies or Herbal treatment for Hair falling or hair loss related various issues. These herbal or natural remedies help you get rid from hair related issues without any side effects and you can enhance your personality again with stylish hair. We are giving here one of the effective home remedy for curing your hair loss and hair fall problems. Generally, Eggs contains a rich quantity of sulphur, phosphorous, selenium, iodine, zinc and protein, which are necessary to stop hair loss and hair thinning and promote hair growth in healthy way. Hair loss can be combated using saffron since it is loaded with abundant quantity of antioxidants. It repairs hair follicles and promotes hair growth. It was found to be one of the best treatments for alopecia. The humectant properties of honey help control and retain moisture in hair and honey is said to strengthen hair follicles for healthy growth. Olive oil moisturizes your hair and reduces scalp irritation, which further reduces dandruff. Olive oil does to help strengthen individual hair strands to avoid hair splits. Firstly, take one egg and separate its liquid transparent part only in a bowl. Now separate it yellow portentous part. There is no need of yellow part. Now add 1 tablespoon of olive oil, 1 tablespoon of honey and 5 to 10 strands of saffron. Now mix all ingredients properly and make paste. Now apply this paste on your hair from root to tips. After applying it, you should wait for 20 minutes. After it, you should rinse all your hair with a mild shampoo. You can use it twice in a month. Spinach should be main ingredient in your daily diet for healthy hair. Generally, Iron deficiency is the main reason behind hair fall. Spinach is a not only a great source of iron but also vitamin A, C and protein. It also comprises sebum which acts as a natural conditioner for hair and provides us with omega-3 acid, magnesium, potassium and calcium. These help in preserving a healthy scalp and lustrous hair. Carrots should be main ingredient in your daily diet for healthy hair. Carrots contain Vitamin A that also helps in healthy hair growth. Deficiency of vitamin A may lead to dry and itchy scalp. Carrots are known to add to thickness of hair, make hair lustrous, improve blood circulation, strengthen the hair, protect hair from external injuries like pollution and also help prevent breakage of hair and hair fall. Eggs should be main ingredient in your daily diet for healthy hair. Since hair is composed of 68 percent keratin protein, eggs help in rebuild damaged hair. They are also rich in a B vitamin called biotin that helps hair grow. Oats should be main ingredient in your daily diet for healthy hair. Oats are abundant in fibre, zinc, iron, omega-6 fatty acids and polyunsaturated fatty acids (PUFAs) that encourage hair growth and will make your hair dense and healthy. Walnuts should be main ingredient in your daily diet for healthy hair. Walnuts comprise biotin, B vitamins (B1, B6 and B9), Vitamin E, plenty of protein and magnesium – all of which strengthen hair cuticles and nourish the scalp. It aids protect your cells from DNA damage which may be caused due to sun exposure. Lentils should be main ingredient in your daily diet for healthy hair. Lentils are an abundant source of protein, iron, zinc, and biotin. They are also full of folic acid which is essential for reinstating the health of red blood cells that supply the skin and scalp with much-needed oxygen. Chicken should be main ingredient in your daily diet for healthy hair. Lean meats like chicken or turkey are abundant in high quality protein which strengthens delicate hair and stops breakage. Strawberries and guavas should be main ingredient in your daily diet for healthy hair. Strawberries comprise high levels of silica. Silica is a trace mineral key for hair strength and hair growth. Other foods abundant in silica include rice, oats, onion, cabbage, cucumber and cauliflower. Vitamin C also stops hair from becoming stiff and breaking. Guava is good source of vitamin C.
Yoghurt should be main ingredient in your daily diet for healthy hair. Yogurt is jam-packed with Vitamin B5 and Vitamin D that are known to encourage hair follicle health. Sweet potatoes should be main ingredient in your daily diet for healthy hair. Generally, Beta carotene protects against dry, dull hair and stimulates the glands in your scalp to make an oily fluid called sebum. Orange coloured fruits and vegetables just like Carrots, pumpkin, cantaloupe, mangoes and sweet potatoes are a good source of this. Use of Shampoo as per your scalp type. Shampoo should as per dry scalp or oily scalp. For instance, over washing hair with dry scalp can lead to hair fall, or not washing oily locks thrice a week can lead to the same. Specially, the shampoo should not be loaded with chemicals including sulfate, paraben and silicone that can make your locks brittle and hence, prone to breakage. Use of good conditioner helps to keep hair smooth. Conditioner comprises amino acids which help to repair damaged hair. Follow healthy Diet and Exercise for keeping hair healthy. There is a need of plenty of protein and iron for healthy hair. Your balanced diet should contain protein and iron rich foods. Yoga and meditation are supportive in reducing hair loss. Avoid chemical treatments for hairs. Go through harsh hair treatments like straightening, perming and colouring are unquestionably not kind to your hairs. You should avoid using blow dryers, curling rods, particularly on wet hair as they actually boil the water in your hair shaft and make them brittle. If you really need to use a blow dry, then keep it on the lowest heat setting. Oiling of hairs is an important thing for healthy hairs. Oiling helps in blood circulation and nurtures the roots. Make sure to massage your hairs once a week with oil that suits your scalp. Cover it with a shower cap and wash it off with a mild shampoo after two hours. Avoid all styling products and increase use of natural home-made packs instead. Regular Trims should be done in every six to eight weeks which helps to protect your hairs to damage from tips. Damaged hair has straw-like texture, and can be chopped off to promote growth and remove split ends. Avoid Stress because it is the root causes for a lot of health problems includes hair loss and hair falling. Stress can avoid through meditation and yoga on regular basis. Avoid taking hot showers which is the root cause of dehydrates strands (just like skin), and strips the scalp of its natural oils, leading to dry, brittle hair that’s more prone to breakage. Instead choose for lukewarm water and try to rinse hair with the coolest temperature. Avoid combing of wet hair because it is the main cause of breakage of hair. Always use toothed comb or wait for combing till dry the hairs. Avoid tight hairstyles which is the main cause of hairs damage. It is also good to not tie your hair tight while sleeping. ← Now RGV to plan a film on Sanjay Dutt titled Sanju: The Real Story! 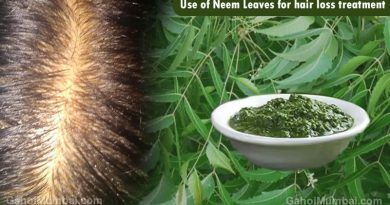 Use of Neem Leaves for hair loss treatment!